Today I’m going to share with you a delicious and nutritious dinner recipe I just recently discovered. As we all know, we Filipinos are not really bent towards having mashed potatoes with our casual food. We’re big instead of having rice as staple for our meals. It’s a Filipino food culture that has been a practice since the beginning of time. And as always, changing culture can be challenging. However, we’re trying to explore other dinner staples in our household, like US potatoes. 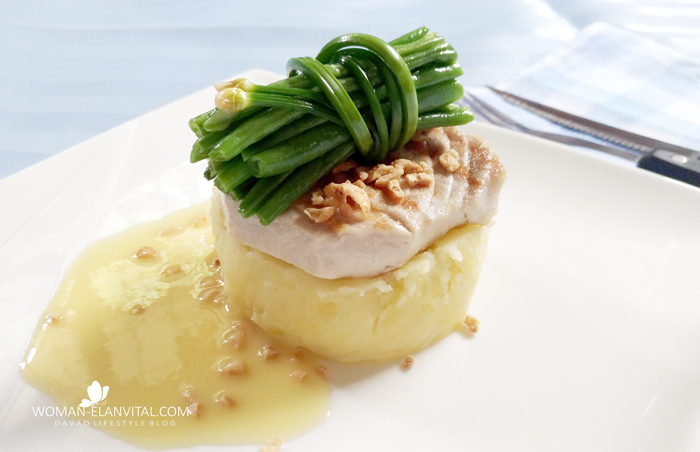 So today I’m going to share with you my US mashed Potatoes and pan-grilled tuna recipe. I realized that potatoes and rice are actually at par with each other when it comes to nutrient content. In fact, US Potatoes are faring above rice when it comes to vitamins and minerals. US Potatoes have more fiber compared to rice. Isn’t that cool? And today is an attempt to gradually switch from rice to mash potatoes as a staple for dinner. Mashed potatoes are very appetizing, it’s just retraining your mind to include it as a staple. Peel, quarter and boil US Potatoes until fork tender. When ready, drain and let it dry a little bit. In a mixing bowl, mash potatoes until smooth. In a pan, melt butter and incorporate the milk until you achieve a smooth mixture, add in salt to taste if you’re using unsalted butter. Add the butter and milk mixture to the mashed potato and mix. Taste it along folds and add more salt if it is a little bland. Salt and pepper the tuna on both sides, coat in the olive oil. Heat grill-pan and add in at least 2 tbsps. of olive oil. When a drop of water dances already in the pan, slowly place the tuna. Turn it only when it is cook so that it’ll leave a nice grill mark on the fish. Wash and cut ends of young French beans. Let it drain completely. In a pan, melt salted butter. When melted, toss quickly baby French beans until the color gets darker. Remove from pan immediately. You can plate it directly. But for an added appeal in which my children love, I bundled the French beans with garlic chive flower sticks. In a warm pan melt the butter, add lemon juice and simmer a little. Add in Worcestershire sauce to taste. Pour it over the fish or in however you wanted the sauce to take. Plate and sprinkle the fried garlic on it. So there you go mommies, gourmet dinner doesn’t have to be pricey, you just have to be creative. Besides, US Potatoes and fish combined are nutrition champions that’ll surely boost your family’s needed energy. Love your recipe, looks like michelin! Potatoes are also my food stable whenever rice isn't available. Already copied your recipe hahahaha.. Thank, will try this one of these days! Thank you, Blair.. you may try cooking it :) thanks for the visit.